An award winning essential pram accessory. Independently tested for strength and safety. A clever and innovative solution to keeping your baby's buggy safe. 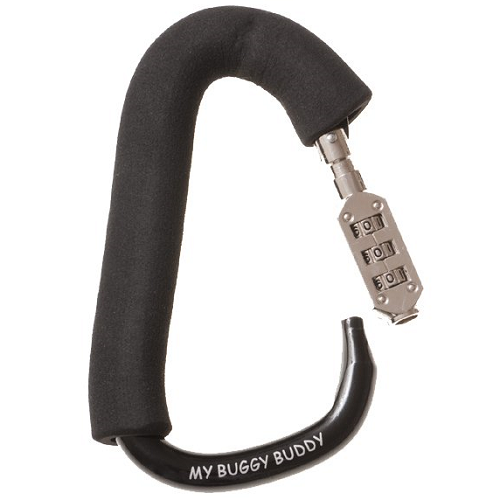 With a 3 digit combination to lock into place, the My Buggy Buddy Lock will secure your buggy to a fence or railings. It also doubles up as a pram clip with which to hang bags from. The loop shaped device is really very simple to use, just connect up, enter your unique combination code and snap shut. Its substantial foam coating will also ensure that it protects your pram or buggy from being marked or damaged in any way. 1 x My Buggy Buddy Lock. With 3 digit combination to secure. Do not overload pram/buggy if using this product to hang bags from.